I had envisioned mud wrestling alligators, swamps, maybe some tacky gift store - but St. Augustine's Alligator Farm and Zoological Park proved to be a family adventure worth taking. Sure the tacky gift shop existed, as did the morbid Gomek display (more on that later), but for the most part the Alligator Farm provides lots of educational experiences (not to mention some very cool alligators). People come from all over Florida, the U.S. and even the world to see the Alligator Farm. An attraction since 1893, the farm has morphed from those wrestling alligators to a very environmentally conscious zoological home for 23 species of is crocodilians. This is the only place in the world where all species are on display. With over 1500 alligators, a variety of beautiful tropical birds from South America and Australia, and exotic snakes and reptiles, the Alligator Farm rates high on the "must see" list for anyone visiting St. Augustine. We meandered through the "Land of Crocodiles", checking out the American Alligators, American Crocodilians, African Crocs, and Asian Crocs. I was enthralled with the albino alligators - they are very rare. My son kept moving; he was intent on seeing the big crocs at feeding time - something about jaws grinding fresh meat that is attractive to a ten-year-old. Heading towards the Alligator Swamp and Rookery, I was impressed with the educational displays and quality of the farm amenities. A wooden boardwalk runs the length of the swamp, allowing you to get a close-up view of the hundreds of alligators that sunned on the banks or swam under the decking. We followed one particularly large one as he goaded other alligators, flipped his tail, and headed towards the fresh meat that comes once a day. Easily mesmerized, you could spend hours transfixed at this alligator jungle. At the end of the boardwalk the bird rookery attracts hundreds of snowy egrets, cattle egrets, and tri-colored herons to the trees and bushes that run along side the boardwalk. During nesting season the snowy egrets are plentiful, stoically guarding their nests as the alligators below protect them from tree climbing predators - making the Alligator Farm a safe haven for the birds and their offspring. Pretty too. We caught the show at the reptile theatre. We learned all about crocodilians and even got to hold a small crocodile. The kids thought that was pretty special. Even with the reptile's jaws closed, I passed. And it was on to Gomek. Gomek was the famous salt water crocodile captured in New Guinea in 1968. An Aussie crocodile hunter named George Craig heard of him from natives living on the shores of the Fly River in New Guinea. Gomek was fierce and extremely feared by the natives. Craig caught Gomek, transported him to the Island of Daru, and turned him into a somewhat more docile creature. 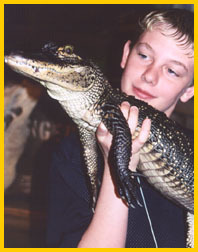 He eventually made his way to the St. Augustine Alligator Farm where he was one of the farm's main attractions. Dubbed, "the largest reptile in the western hemisphere", Gomek had quite a following. After his later life of leisure, Gomek died of a heart attack in 1997. Though gone, Gomek is not forgotten. His statuesque form has been preserved through taxidermy and displayed in a permanent exhibit. An entire building is devoted to Gomek - surrounding his huge form is the history of his life, complete with native music and panoramic murals of the river where his life began. I found the display a bit creepy - after all Gomek was ripped from his native land and held in captivity most of his life. But the crowds seemed to love it - and it continues to be one of the most popular exhibits at the Alligator Farm. 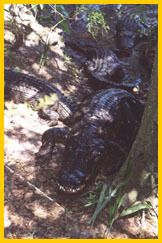 The Alligator Farm is open seven days a week. For current information call (904) 824-3337. And yes do stop in the gift store for some unique crocodilian memorabilia. For more on the Alligator Farm see www.alligatorfarm.com.